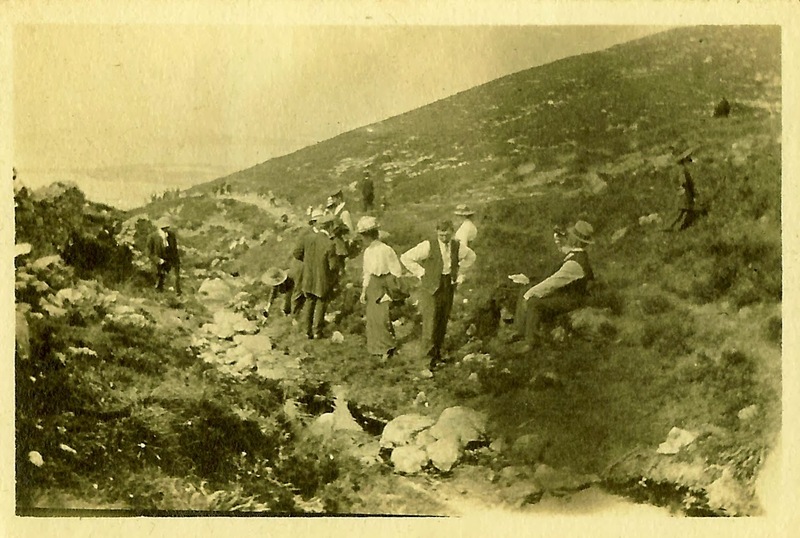 Westport.” Probably taken on Sunday, July 27, 1913, also known as Reek Sunday. It turns out that the Irish consider this it to be the holiest mountain in the country. 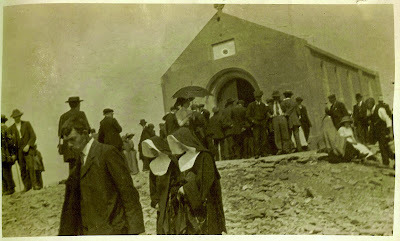 Croagh Patrick, or Holy Mountain, Reek Sunday, July 27, 1913. Situated 2510 feet above sea level in County Mayo, western Ireland, the peak is revered in Irish history as the place where in 441 A.D., Saint Patrick, who introduced Christianity to Éire and became its patron saint, spent the 40 days of Lent in fasting and penance. From there, Saint Patrick also is said to have banished the snakes and demons from the Emerald Isle. The path is fairly tricky to navigate; every year people have to be airlifted from the mountain due to injuries or other medical emergencies. 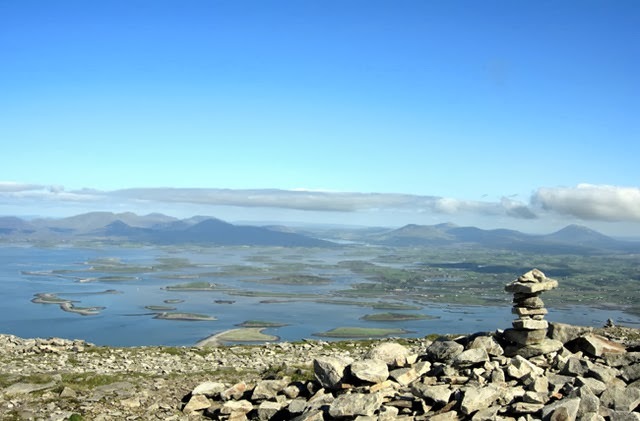 Those who reach the top are treated to an expansive view of Clew Bay and its small islands, reputed to number one for every day of the year. of Mountjoy Jail in Dublin. I am unable to identify the man at right. The two main pilgrimage days are in the summer, about a fortnight apart. The first is on the last Sunday in July, also known as Reek Sunday. The second is on August 15th, the Feast of the Assumption of the Blessed Virgin Mary. As Benita and her traveling companions were staying with her relatives in Ireland during the summer of 1913, the timing would have been just right for their pilgrimage to this sacred ground. 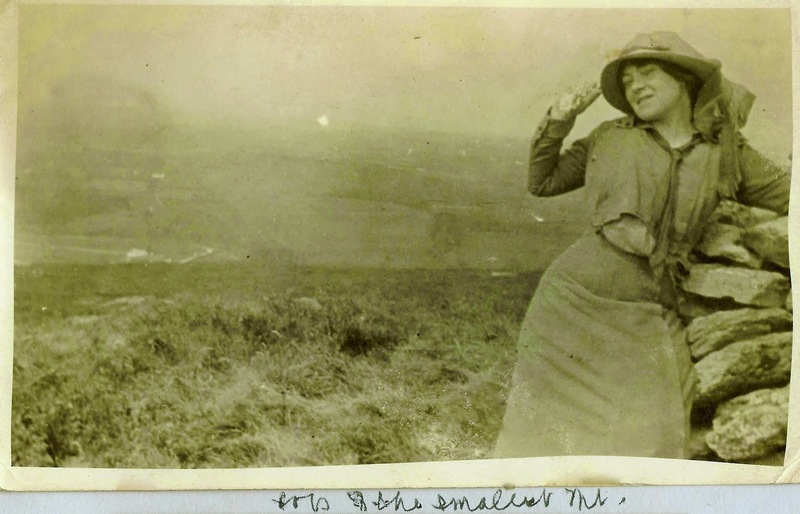 One can imagine her Irish cousins inviting her to join them. Whether they started their trip in Dublin, where one of Benita’s cousins was chief officer of Mountjoy Jail, or County Roscommon (possibly Drumbrick), where much of the family was from, it makes sense that the group traveled to Westport on a day when no one had to work. 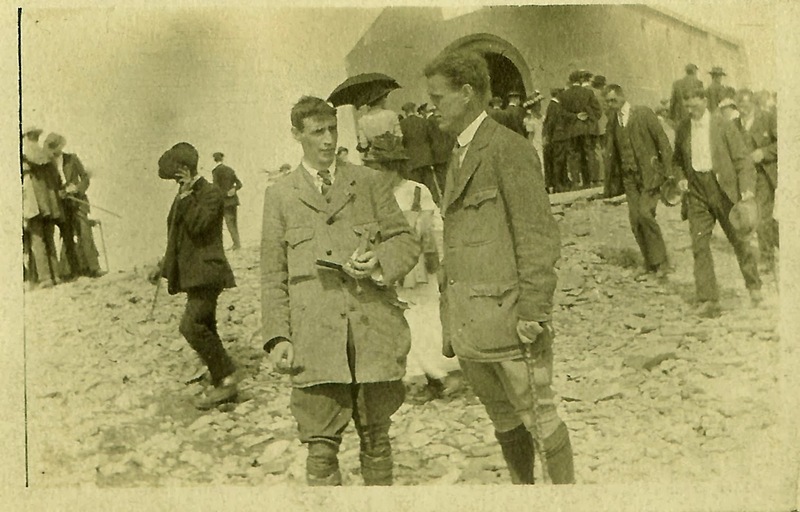 For this reason, I think they arrived there Saturday, the day before they climbed the mountain on Sunday, July 27, 1913, a little over a century ago. cairn of Croagh Patrick, the Holy Mountain of Ireland, County Mayo, 1913. What an experience it must have been! 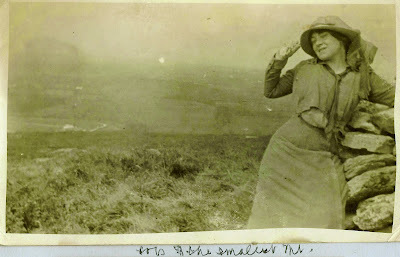 In the photograph here, a 23-year-old Benita triumphantly stands at the summit cairn overlooking the islands of Clew Bay, at the pinnacle of her youth. I wish all of us could have pictures like this, so that as we age and one day move on, our descendants can see us in our youth, full of daring and wonder, saluting them from the top of the world. 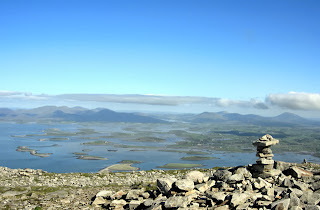 The summit cairn, “unofficial” summit of Croagh Patrick. Shown today, it looks about the same as it did a century ago. Courtesy Wikipedia; in the public domain.